The General Data Protection Regulation (GDPR) : what is it all about? In April 2016 the European Parliament adopted the General Data Protection Regulation (GDPR) which was presented by the European Commission (EC) in January 2012. This regulation was adopted by the EC to protect individuals from unintentional and intentional misuse of personally identifiable information (PII). On May 25th, in the year 2018, the GDPR went into effect. This means that GDPR is not something that can be ignored – it comes with financial penalties and violations that can put your whole business model at risk. GDRP is a set of rules governing the privacy and security of personal data and other elements. GDPR applies not only to organizations in the EU, but to any organization doing business with EU citizens, in fact, any organization processing or storing data for individuals within the EU. GDPR makes data governance more important than ever before. An effective data governance solution will help you understand your data-processing activities and identify and document the legal justification for each type of activity. Blog with Q&A from the webinar. HOW CAN SEMANTIC INFORMATION MANAGEMENT HELP TO PRESERVE MEANING IN A DYNAMIC DATA ENVIRONMENT? ... by Ralph Hodgson : "How Data Governance Capabilities for Profiling, Cataloging and Lineage also Support Regulatory Compliance". GDPR showed how regulatory compliance can be seen as a key driver of data governance initiatives and showed why enterprises are increasingly turning to graph-based knowledge representations to meet their regulatory compliance challenges. 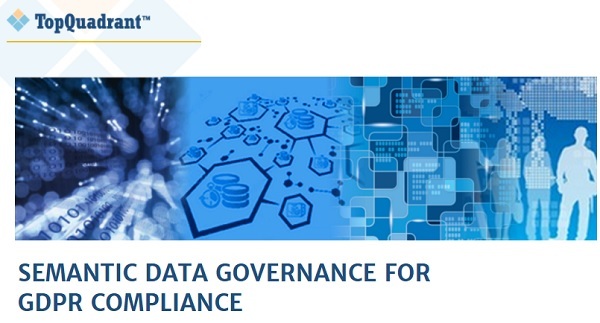 By connecting all the related metadata, data, forms, and other compliance collaterals, these technologies enable organizations to navigate complex data governance landscapes such as those entailed in GDPR. The figure above is an example Neighborgram™ (screenshot) from TopBraid EDG™, annotated to show how within a knowledge graph we connect (1) individual PII data elements to (2) the situation of their use to (3) any GDPR obligations that apply, and finally to (4) the specific applicable terms from the GDPR regulation documentation. How big will big data be under the GDPR?